Welcome to Beach Pines Cottage! This charming four bedroom cottage provides the perfect family getaway. Located in Union Pier’s private Lakeshore Cottages neighborhood, Beach Pines Cottage comes with easy access to the association pool and rec room. You are just three houses away from the pool, about 1/2 a mile from Town Line Beach, and within similar walking distance to Izzy’s Bean and Gelato, Black Currant Bakery and Nani’s Cafe & Beach Shop in the cute little Union Pier downtown. Through the front door we find a bright, cozy living room with a fireplace and a flat screen TV. An open kitchen and a generous dining room provides ample space for gathering with friends or family. The main floor also houses a king bedroom with direct access to a full bathroom. A three season’s room provides a welcome gathering space closer to the outdoors or even dinner al fresco.There are three dining options in total - indoor, outdoor or in the screened in porch. At the top of the stairs is a small sitting space overlooking the living room. There are two bedrooms on the upper level - a queen bedroom and a bedroom with a bunk bed(with trundle) and a full bed. This room sleeps five people and is perfect for adults and kids! These bedrooms share a full hall bathroom with a tub. Speaking of kids, Beach Pines Cottage comes with a pack and play and a high chair with booster seat so your packing will be a lot easier! The lower level of the house has the fourth bedroom, which has a queen bed with a private bathroom and shower. There is also a large open entertainment room that is perfect for catching a game or a movie. You can play a game of pool or convert the table to an air hockey table. A nice assortment of board games for all ages will let everyone play for bragging rights! 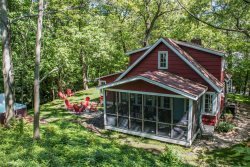 Located right in Union Pier, Beach Pines Cottage is a warm and comfy home that is wonderful for family groups looking for easy access to all that the Lake Michigan area has to offer. needed the pool - very enjoyable!! The team in the office when I checked-in were all very friendly! It was awesome, thank you!